Mom is going away on business for two whole weeks. Sigh! I met a doggie named Rocco. Mom was hoping she could leave me with him while she is at work so that I would not be lonely. So Rocco's Mom said it would be a good idea to see if we got along. We went over to Rocco's house one weekend. He has a nice yard. Lots of grass. I kept investigating the entire area plus their portch. Hehe! I kept barking at him to ask him to play but he just stared at me. I think he might have been afraid of me. I wanted him to chase me but he just played with his stuffed toy. I was naughty and took his toy from him. While I was playing with it, he tried to sneak behind me and take the toy away but I was naughty again and growled at him. I usually growl when others try to take a toy from me but it is all in fun. I still wag my tail to let them know that. A bit later, I relented and left the toy so he could play with it. I like his Daddy. He whistles and it is fun to run over to him. My Mommie has tried to learn to whistle but she just can't do it. Haha! His Mom said the next step was to see if we would be ok being left alone with each other. I do not think they will go through with it coz his Daddy was not very happy hearing me barking at Rocco. I like to bark at the sound of owls hooting outside the house. Whenever the commercial for Vonage plays, it is as if an owl is in the house. Mom said it is because the ad has the song WooHoo by the band 5.6.7.8s. It has a repeating line that goes Woohoo Woohoohoo. Sounds like an owl hooting to me. I keep going to the TV and looking for the owl. But by the time I reach the TV, the ad is over and the hooting has stopped. But when Mom was watching Kill Bill Vol 1 last night, they had the entire WooHoo song playing. I kept trying to get into the TV to get to where the owl was. Yuck! There is an article in the Aug 14th's San Jose Mercury News titled 'Troubled Park's Buried Past' that says the Watson Park is San Jose is contaminated. The link is below but it keeps asking to register to SJ Mercury News so another way to get to the article is to just search for Watson Dog Park Contaminated on Yahoo. A few weeks ago, Mom started to allow me go to the carpeted areas in the living room coz I do not shed so much anymore since my undercoat is all gone. Now I have more room to play in. We usually play catch and chase each other around. It's so much fun! She even lets me go up on the sofabed. I like to explore all the stuff she has in the living room. And now I get to come right up to the TV as opposed to before when I had to watch it from afar. There is a fishbowl on one of the tables. There used to be a small goldfish in there but I think it is gone now coz the last few times i visited the tank, it was empty. I still check it everyday to see if the fishie will be back. We went to the Watson Dog Park on Jackson and 22nd in San Jose, CA. The last time I was there, Mom put me in the small doggie area coz she was afraid of me playing with the big doggies. I kept looking at the big doggies and ran with them from my side of the fence. This time, we went to the park to meet Ziggy and his mom. When we got there, they were in the big dog area so I was able to join the big doggies. Goodie! 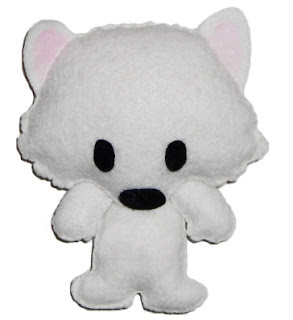 Ziggy is the first American Eskimo I have seen around here. I really like his name. He is very energetic and runs around with the big doggies. I was a bit distracted with all the people and doggies there and of course I had to check out the perimeters of the dog park. The big doggies were drooling and a couple of them jumped up on Mom. She was holding my leash at the time and her hand and the leash were covered in drool. Hehe! We went to the Belmont Dog Run in Belmont, CA. It was just a big enclosed area. No grass or anything. There was a Samoyed there. She looks like a big version of me. All white and fluffy!!! She reminds me of Buddy. 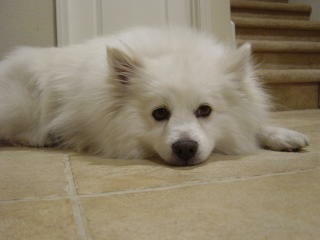 Buddy was the standard American Eskimo I used to live with. The Samoyed's Mommie said that she went to agility classes and knows a lot of tricks. I chased her around the park but she kept jumping on the tables. I could not reach her there. Also, she kept looking at the fence. Her ears were up and she was all alert. I rushed over to see what she was so interested in but I did not see anything. I'm not sure what she was looking at but she sure spent a lot of time near that area of the fence. I decided to check the perimeter while she was busy with whatever it was she was looking at. A couple of more doggies came and one of their Mommies threw a frisbee. I rushed over to catch it. Mom keeps telling me that it is not for me and that the lady was throwing it so her doggie could catch it. Hmph! Well I like to catch it. Another lady threw a ball and I got to it before her doggie could. Haha!! I am the fastest. Even tho I am so much smaller than them. I get tired easily though so I keep having to rest up. It takes me twice as many steps just to keep up with them.